Happy (almost) Valentine's Day everyone! We are kicking off this week with a few more Paradox Point blocks. 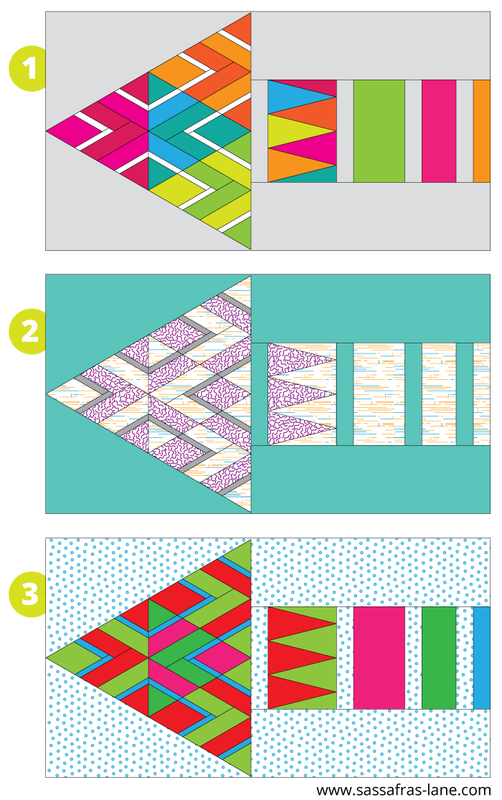 These blocks are fun, bright and perfect for a little Monday quilty inspiration boost. Let's get started! 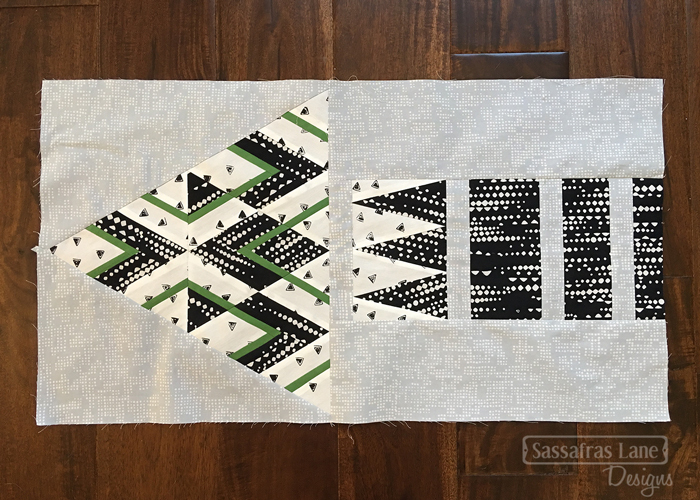 Kristy's block 4 features a white fabric with small black triangles, a black fabric with white geometric prints and a solid green for the accent. This green color is dreamy and looks great paired up with the black and white Me+You prints! 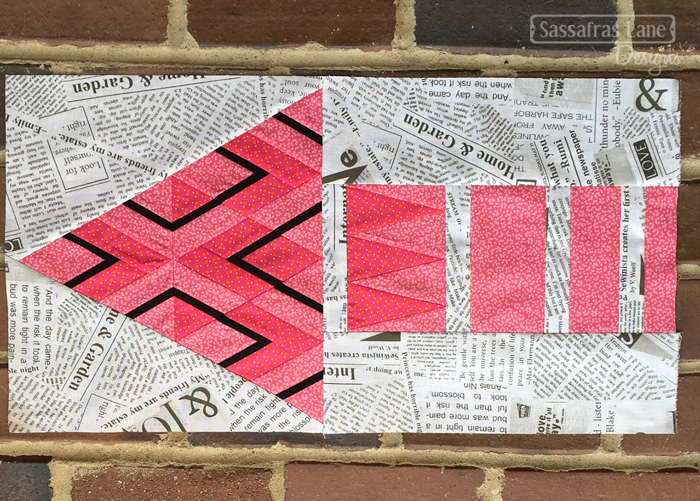 Juli's block 4 is the perfect Valentine's Day block! She paired two pink prints, one small floral and one polka dot, with her solid black accent. Her newsprint background with the bright colors is still making me swoon! MaryEllen is slaying her blocks and this week's features two low volume prints for fabrics A and B, and a bright yellow for the accent. This combo jumps off this dark tone-on-tone background! Alayna has a block 4 for us today too! I absolutely love her fabric selections for this one. She used one pink and one lilac Alison Glass print for fabrics A and B with a charcoal accent and light grey sketch background. 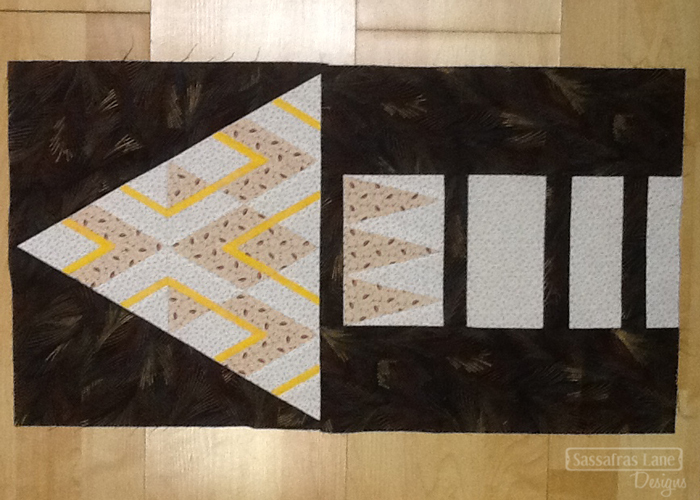 When sewing the arrow edges to the triangle, pin the top, bottom, and middle. If one of them is larger than the other, put the larger triangle on bottom so the bias eases in. Color Crazy - This is a fun block to use all those thin strips of your favorite fabrics you have squirreled away for the perfect project! Turn Down the Volume - I am still loving the idea of a low volume Paradox Point. Who is going to make one so I don't have to! Holi-Daze - I was thinking of all those bright, fun and modern Christmas fabrics when designing this one. I see a table runner in my future! This week's winner is the amazing over-achiever @withclubsauce516! 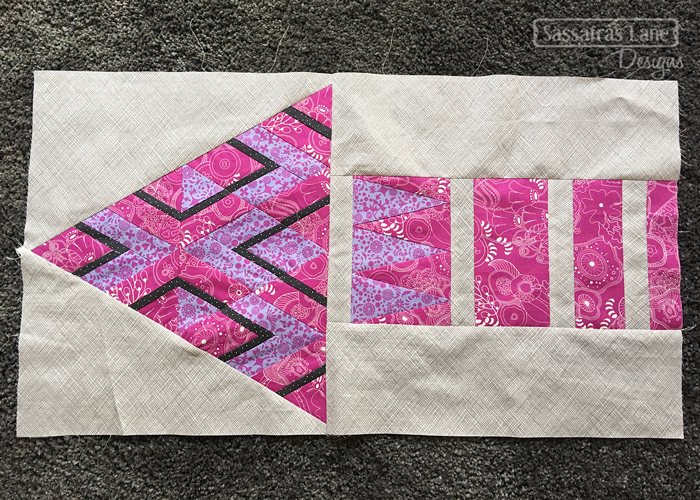 She shared this photo of all 12 of her completed blocks and we are absolutely in love with her fabric choices! Now your turn! We want to see how your blocks turn out. We have started a Flickr group so you can add your photos there. You can also tag photos on Instagram with #ParadoxPointQAL! We will pick another winner for a small giveaway from everyone who participates. First time here, no problem! Join in the fun. Read up on the previous posts here, grab a book and begin when it works for you. Thanks for stopping by and don't be shy with any questions and comments!